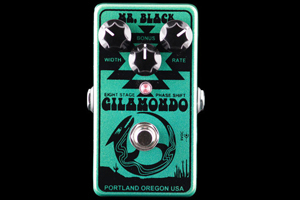 GilaMondo is an 8-stage phase shifter at heart, but it’s got a little more going on than you’d expect from its three simple controls. GilaMondo will get THICK and SYRUPY! And its Cobra Tone capable. See that knob labeled BONUS? Turn the Width control to zero, the BONUS knob now works as a manual control so you can “park” the phase shift at your favorite frequency. This is really cool after a distortion pedal or in an effects loop. This is the Cobra Tone. Organically grown in Portland, Oregon. Keep it natural, man.